Bruce Carlley is going to show you a number of games that the magician or gambler plays against a spectator one on one. The spectator gets a free choice of the objects that are used in the gambling game. (Some games use cards, dice, pieces of paper, spinners, etc.) For example, say the spectator has a choice of four dice. Spectator picks one die and the magician picks one die. Each rolls their die, and the high number wins. Whoever wins a best of 12 game match wins the game. Unfortunately for the spectator, the magician will almost always win the match. The probability will ALWAYS be in the magician's favor. There is no sleight of hand or funny business. These type of games are called non transitive games. 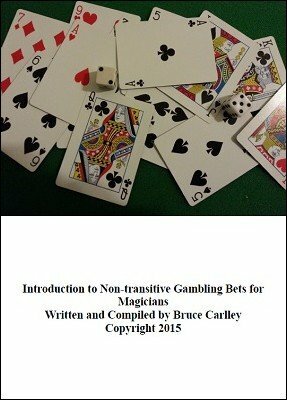 What is a non transitive game? A beats B. B beats C. And C beats A! The best explanation would be to give an example that you may know. Rock- Paper-Scissors. The game is played between 2 people. Each player puts one hand behind their back and forms one of three shapes with their hidden hand. A rock (closed fist), paper (a flat hand) or scissors (index and ring fingers forming a "v" shape. When someone says "go", they simultaneously bring out their hands. Rock beats scissors by crushing it. Scissors beats paper by cutting it. Paper beats rock by covering it. 1st edition 2015, 34 pages.